Dimensions with Stand: 47.7" x 33.2" x 14.6"
Dimensions without Stand but with Speaker: 47.7" x 31.3" x 3.8"
The Panasonic TH-50PX75U is a current late, 2007 plasma model. The model is assembled in Mexico, though the plasma display element (screen) is manufactured in Japan and shipped to Mexico for assembly. Up conversion from 480i and 480p: This entry level Panasonic plasma did not spare any technologies concerning picture quality. The up conversion from 480p sources was true to the original content, realistic, and clean. 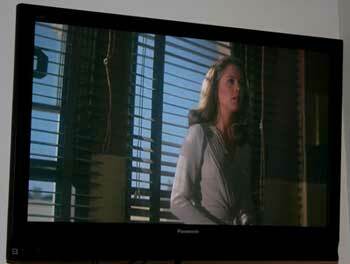 When viewing Body Heat, the picture was alluring and smooth as Kathleen Turner pleads with her husband not to go down stairs as her lover William Hurt enters the house to kill him. The plasma TV cleaned up the motion artifacts well and there was no false contouring. 720p/1080i/1080p Picture Quality: 300 showed off its vibrant and intense colors on the 50PX75U with precision. When a picture looks this good with 1080i content it’s hard to imagine what consumer occupation with 1080p panels is all about. Black color information was not over saturated/overpowering as with many displays. Black Level: Excellent black levels are a trademark of Panasonic plasma TVs and this unit is no exception. Blacks are deep and rich yet not overpowering. Dark Shadow Detail: Black levels and dark shadow detail are Panasonic’s strongest suit. This remains the case with the 50PX75U. Most recently LCDs and some plasma TVs have overpowering black levels when scenes are dark – causing a blacking out of subject matter and the loss of all detail. This is not the case at all with the TH-50PX75U, there is no loss of detail but the excellent black levels remain. Color Rendition/Color Accuracy: Though not as vibrant as the Pioneer plasma colors, Panasonic is excellent in this category. Color information seems more realistic on the Panasonic than any other TVs I test. Motion Lag: There is no detectable motion lag. False Contouring/ Mapping: Post calibration, there was no false contouring/mapping issue. 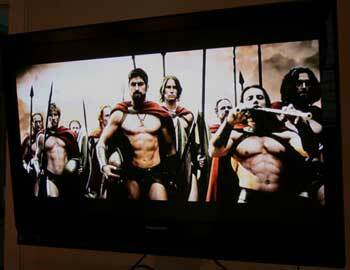 Scaling: Panasonic has traditionally had very good scaling capability in their plasma TVs. This plasma is no exception. Performance using the Just option shows off the algorithmic justification (stretching) that is pleasing to the eye and not seemingly distorted. Inputs: This plasma TV contains essential 2 HDMI, 2 Component, but no computer input of any kind. The PX75 series plasma will not accept a computer signal. Aesthetic Considerations: The TH-50PX75U is polished in appearance with a gloss black finish, 2 inch bezel. It has a very thin, hidden speaker housed beneath the screen. Remote Control/Menu Functionality: This Panasonic plasma offering has a very basic remote control. The PX75 series is an a price point offering from Panasonic so functionality is where they cut corners. There is no computer input and only 2 HDMI inputs (why one would need more I do not know). The remote control is basic as are the onscreen menu options. To reach your input choice you must scroll through the options using the TV/Video button on the remote – another annoyance. Audio Output: Audio output is solid from the speakers, very sufficient for the 20 X 20 room I tested the plasma in. Using the HDMI input for sound increased volume levels considerably on this plasma. Features: There is no TV Guide Onscreen option, no Picture in Picture, no headphone output, no discrete input settings. In fact, setting up the correct picture settings was slight pain for different inputs. The only “extra” feature you get is an SD card slot for photo viewing is you are so inclined. Price Considerations: $1799 is a very good price for this quality of picture. This 1366 X 768 plasma will perform just as well as its 1080p counterparts, which cost $1000 more. Of course it won’t accept 1080p signals but I dare you to do a site test between a 1080p signal and a 1080i signal pumped into a 1080p plasma TV and swear you can tell the difference. My trained eye can not. Quality Comparison: Plasma still outperforms LCD by quite a bit in picture quality. The TH-50PX75U plasma TV will give the owner a stellar picture, surpassed by very few 50” plasmas on the market and I would venture to say no LCD televisions. The only drawback is the lack of all those extra features. This is a great looking display with bare bones features.